OK, you just saw Fat Head and me skipping a jig in the Salem Canal, a tributary of the Delaware River. It was the only way to catch them. Our day was cold and blustery. The fish were positioned back under the shoreline cover and aggressive doesn’t describe the bite. That’s called tough. But, we had to make the best of it. Filming, fishing a tournament or fishing on your day off work is all the same when it comes to the weather. You deal with current conditions. Period. 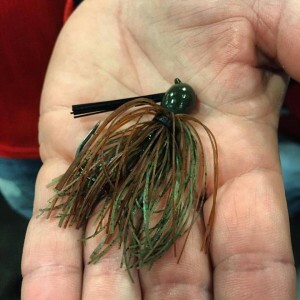 We fished with Missile Jigs’ Mini Flip jigs. There’s a reason for that: It’s the best small skipping jig that’s available when the bite gets tough, and I don’t say that just because I’m a part of their team. It’s the bait I used to win the Bassmaster Elite Series event on the Delaware River. There are at least four things that make it my go-to lure for the kind of fishing conditions you saw on Salem Canal Revenge. 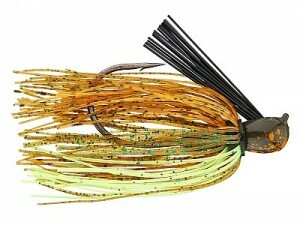 The first is that it’s small and compact, much smaller and more compact than other jigs of the same weight. Even the largest size, 1/2 ounce, is relatively tiny. When you don’t want to show the bass a huge profile this one’s where it’s at. That small profile is useful when the local forage is small. If the fish aren’t actively feeding, you don’t want to show them something different, something they haven’t seen over and over again. That’s an immediate turnoff. The smaller size also gives the Mini Flip a faster rate of fall for its weight. That helps trigger a reaction bite when the fish are tight to cover. They have no time to figure anything out. They’re predators. They attack. The last thing — not counting quality construction and an affordable price — that makes this jig so great is that the head design makes it skip easily and with super accuracy. You can put it back where the fish are, and where the other guys aren’t. I start with a 7 foot, 2 inch medium-heavy Abu Garcia rod with a soft tip. (It’s one of my Signature Series rods.) The length is critical. I designed this rod specifically for skipping small jigs. I added 2 inches beyond the 7 foot mark because that’ll give you extra distance and accuracy without the rod becoming too long and too heavy. My reel was an Abu Garcia MGX model, 7:1 gear ratio. I spooled it with Trilene 100% Fluorocarbon, 17-pound-test. I selected that particular line because it’s heavy and has a fast sink rate. That helps the jig get down quickly where it needs to be. That’s a part of triggering a reaction bite. I’ve mentioned each product I used not because it’s the only good stuff out there. It’s not. But it is what I use, and I only use products that help me catch fish and that I can rely on day after day under tough conditions.